The 1979 World Jamboree was supossed to be held in Iran, but pollitical unrest made it impossible. 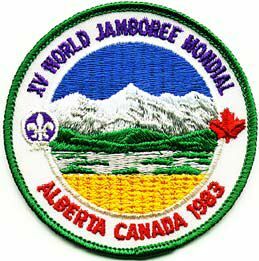 Thus the Fifteenth World Jamboree was not held until 1983. On the slopes of the great Rocky Mountains near Calgary, Alberta, Canada, more than 15,000 Scouts gathered in Kananaskis Country in 1983. The Jamboree marked the celebrations of the 75th anniversary of the Scout Movement, and the 125th birthday of its Founder, Lord Robert Baden-Powell. Theme: The Spirit Lives On. Jamboree activities took full advantage of the rugged mountains, and the excitement of the Wild west.